The Eleventh Annual Scooting The Ozarks Rally will be September 10-15, 2018 in beautiful Eureka Springs, AR. This is a riders' rally, with most of the daylight time spent riding the twisties of the Ozark Mountains of northwest Arkansas. All scooters, modern and classic of any size, are welcome. Register by May 30 for a discount in registration fees. Visit our forum for more information and registration. 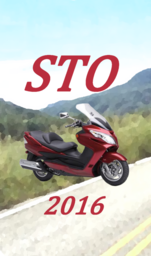 STO 2018 was a great rally. We had great weather, no rain, comfortable temperatures. Had scooters ranging from 125cc to the 650 Burgmans, and one 950cc motorcycle. A Vespa rider led several rides, including one I went on. I have a new respect for the abilities of the modern Vespa.